I went for a starry night background. I used Fabriano watercolor paper (cold pressed for more texture) and Mijello Mission Gold watercolors. I masked the edges with painter’s tape and created the galaxy. Once it was dry, I splattered white acrylic paint mixed with water over the background and left it dry completely. I then stamped the trees. It’s a set with three stamps from Lesia Zgharda Design called Carpathian Pines (FL230) that I got from Charlie and Paulchen’s store. Next, I removed the tape and adhered the panel to a top-folded card base using adhesive tape. 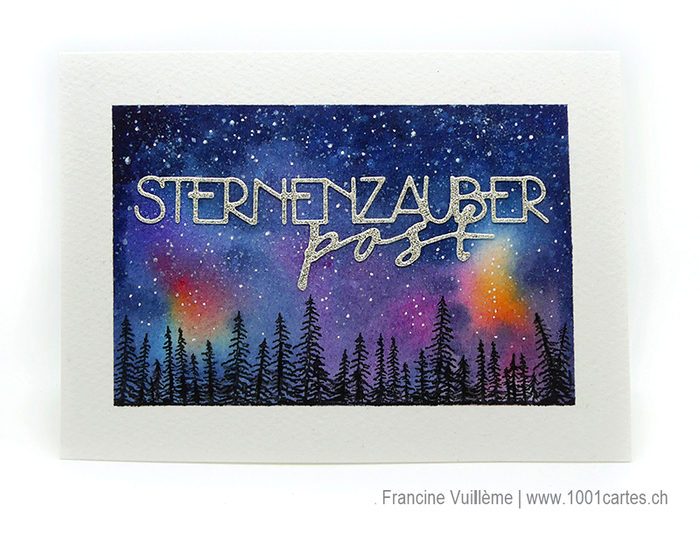 I die cut the Sternenzauberpost word die (it means something like Magical Stars Mail) from silver glitter cardstock and adhered it to the sky using glue. I hope you like the card! I absolutely love how it turned out! This is so beautiful - what a lovely holiday card! Gorgeous starry sky and I love how you added pops of color to your design! Love your sparkly sentiment, too...such a pretty card!